Prostanthera nivea var. nivea, Snowy Mint Bush is an upright shrub growing to a height of three metres. Leaves are light green, linear and about four centimetres long. Flowers are white to mauve. From September to December plants become covered in blooms. Prune after flowering to prevent plants becoming straggly. P. nivea var. nivea is a handsome, eye catching shrub particularly during the flowering period. The Snowy Mint Bush would be an ideal addition a native shrubbery. P. nivea var. nivea is widespread and is found in Queensland, NSW and Victoria. 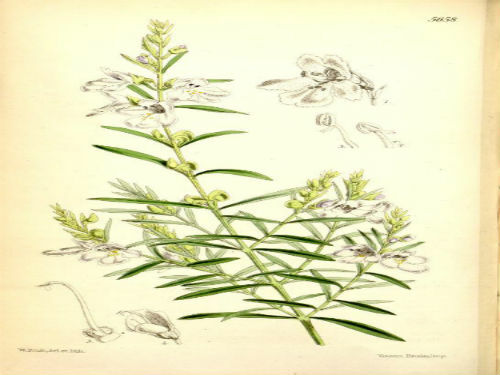 The Snowy Mint Bush has a long horticultural history. The lower image is drawing of a plant that was growing in Kew Gardens, UK in 1867. This plant was raised from seed imported from Australia. The species and variety name means snowy white and refers to the flowers. P. nivea var. induta is the other variety. We feel that this variety deserves species status as it so different from P. nivea var. nivea. In fact their only similarity is that they are both Prostantheras.